Our goal is to CREATE COMPELLING STORIES AND DELIVER CREATIVE CONTENT THAT BUILD OUR CLIENTS’ BRANDS. Convince the customer: In many enterprises, the customer is the number one factor that limits development of success stories. To help convince customers to agree to sign their name to a success story, you must explain the benefits they will derive. For example, remind them that they can show the completed success story to senior management or board—demonstrating that they are innovative, solution-oriented, and focused on business benefits. Another way to help convince customers is to tell them they will receive a framed copy of the final success story as a form of thanks. That framed copy, hanging on the wall of the customer’s office, will become a symbol of the successful relationship between the customer and the solution provider. Over the years, colleagues, co-workers, visitors, and others will see that physical reminder of their achievement. Work with customers to ensure success: Customer involvement is much more than just the initial “OK” to proceed. The following tips will help ensure a positive customer experience and successful completion: (1) Obtain customer permission before writing the document, solicit input during the development, and secure approval after drafting it. (2) Rather than asking the customer to draft quotes, write them for their review; doing so usually results in more compelling material. (3) Use “homegrown” customer photos to personalize the story and help connect with readers. Agree on a common organization: The time-tested, most effective organization for a success story follows the problem-solution-benefit flow: (1) First describe the business or technical problem or issue. (2) Then describe the solution to this problem or resolution of the issue. (3) Finally, describe how the customer benefited from the solution. Get started with a bang: The most prominent parts of a success story (title, subtitle, and benefits bullets) are typically the most difficult parts to get right. My best advice is to start with a bang. Use action verbs and emphasize benefits in the title and subtitle. Include a short customer quote in larger text. Then, summarize the key points in 2-3 succinct bullet points. The goal is to tease the reader into wanting to read more. Try to quantify benefits: No single element in a success story is more compelling than the ability to tie quantitative benefits to the solution. For example, “Using Solution X saved Customer Y more than $Z after just six months of use.”. Quantifying benefits can be challenging, but it’s not impossible. The key is to present imaginative ideas to the customer for ways to quantify the benefits, and remain flexible during this discussion. If benefits cannot be quantified, attempt to develop a range of qualitative benefits, which can be compelling as well. Address tailored solutions: Even highly tailored solutions and services can be described in an effective success story—by writing first about a more general problem in the industry, then transitioning to the specific problem that the customer faced. In the solution section, use the opposite sequence: Describe how the solution solved the specific problem, then indicate how it can also help resolve the issue more broadly within the industry. Beginning more generally draws readers into the story. Concluding more generally allows them to understand how the solution can address their problem. Find the right writer: Finding adequate staff time to make the success stories happen is a common logistical limitation. And even with the best plan, a success story is doomed to failure if the writer doesn’t know how to write success stories. A talented writer can make the difference between an effective success story and one that falls flat. 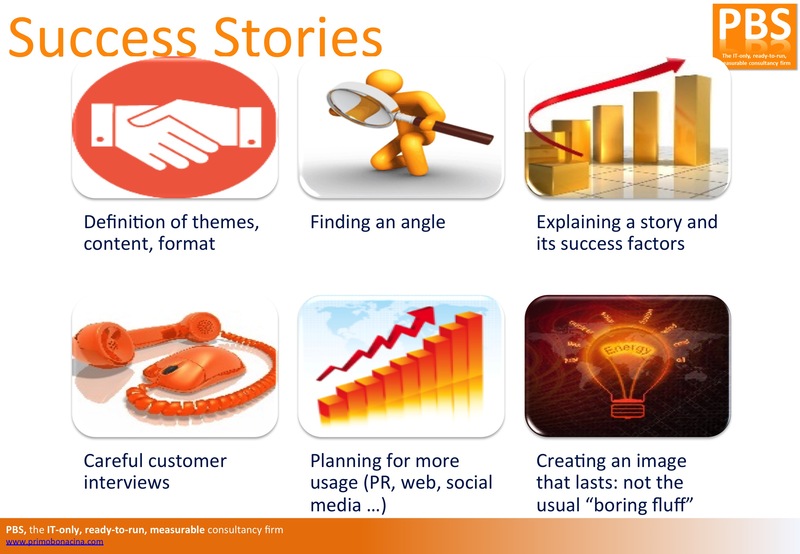 When marketing staff time is limited, many enterprises outsource success story writing. Your stories can be sent to select journalists and then used on a variety of media, including your web properties and social media.